Measures must be taken to help mortgage holders struggling to meet payments, according to Sinn Féin Finance spokesperson Arthur Morgan, TD. 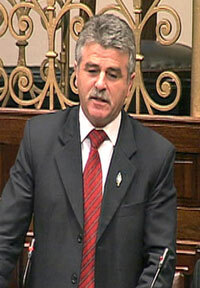 Morgan said recent figures from the Central Bank showed a 13% increase in the number of mortgages in arrears. Many of these people are paying mortgages on homes now in heavy negative equity. “Since the economic crash, the balance between prices, incomes and mortgages has become distorted, with ordinary people struggling from day-to-day,” he said. “Over 32,000 ordinary citizens were in mortgage arrears for more than 90 days at the end of March, an increase of 13% since the end of December 2009. Morgan pointed to the ghost estates around the 26 Counties, people saddled down with debts and financial burdens, and asked why it is only bankers and developers who are being lent a helping hand. “Ordinary people of this State will have foot the bill for a decade of risky speculation and a Government-fuelled property bubble,” he said. “The depth and scope of the financial crisis extends beyond the banks into ordinary households and we need to ensure that assistance for ordinary people is justly prioritised.